In Fall 2017, Disaster and Society, a graduate course offered in Disasters Studies M.A. program was designated as service learning course. The service learning is defined as "a thoughtfully organized service experience that addresses a need in the community in a reciprocal and mutually beneficial relationship and integrates a reflective component that relates the service experience to academic course objectives and the student’s learning (service = learning).” (UTRGV, 2017). This course provides students with service learning opportunities from community partners who are key stakeholders, who are actively involved in managing disasters and emergency. The following Service Learning Objectives are set in the course. SLO 1: To learn firsthand experiences from partners from a community which was recently hit by a disaster. SLO 2: To learn firsthand experiences, issues, problems, and challenges from our community partners from local, county, state, and federal organizations. SLO 3: To learn hurricane disaster preparedness from individuals who live in the Rio Grande Valley in the aftermath of Hurricane Harvey. 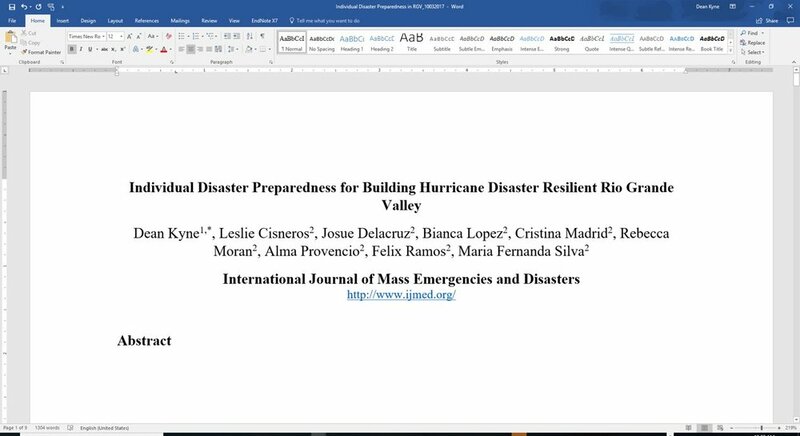 SLO 4: To apply theories and concepts in order to solve the problems, issues, and challenges learned from various community partners in managing hurricane disaster and emergency effectively. SLO 5: To prepare a report that contains experiential learning and sustainable solutions showcasing application of theories and concepts learned in the classroom to problems, issues, and challenges in managing disaster and emergency effectively. 1. Jordan Mims, volunteering coordinator, Associate Pastor of Youth and Missions, Rockport Volunteer Reception Center, the First Baptist Church. To have this service learning opportunity, we traveled to Rockport and Corpus Christi on November 15, 2017. Our trip was approved by the Dean of the Students office in days advance. We left UTRGV around 6:20 am, had breakfast at iHOP around 9:00 in Corpus Christi, and finally arrived at Rockport around 10:20 am. As soon as we arrived at the Rockport, we met Jordan Mims, Associate Pastor of Youth and Missions, a volunteer coordinator who helped us registered at the Rockport Volunteer Reception Center at the First Baptist Church. He was a great help. Students were provided with learning opportunities of managing volunteers at the reception center. Then, we helped Hurricane Harvey's victims, Mr. and Mrs. Kress, remove debris from their house compound. Next, we met the Mayor's team at his office at the City of Corpus Christi. Later, we visited the emergency operation center (EOC) of the City of Corpus Christi. Students learned firsthand experiences from Jordan Mims, Volunteering Coordinator and Associate Pastor of Youth and Missions at the First Baptist Church in Rockport. Students engaged in a series of discussion topics related to managing volunteers as well as the volunteer center. My students helped Mr. and Mrs. Kress removed debris from their compound. This volunteering in rebuilding after hurricane event provided an opportunity for my students to gain firsthand experience from the victims of the Hurricane Harvey. They engaged in conversations with Mr. and Mrs. Kress' family on challenges, problems, and issues they faced in rebuilding after the hurricane event. Emergency management coordinator, police chief, and fire chief reenacted how they provided essential information to the Mayor in order to make an evacuation decision in this meeting room before and during the Hurricane Harvey event. The GIS map showing the evacuation zones was displayed hanging on the wall. Students were excited to have this service learning opportunity in the emergency operation center. The emergency management coordinator, Billy Deldago, and his team members including section chiefs reenacted how this center was activated and operated during the Hurricane Harvey event. My students were inspired by a female district coordinator, Brandi Ashby-Fisher, Texas Division of Emergency Management, Texas Department of Public Safety, Corpus Christi, Texas. She definitely eliminated any doubts of possible gender discrimination in the male dominated disaster and emergency management profession. Students were provided with tips on how one can successfully enhance professionalism in this emergency and disaster management field. Students are provided with this learning opportunity to understand how FEMA handled debris removal after the Hurricane Harvey event. An aerial drone was used to observe a very long dumping site along the Highway 35 in Rockport. Mr. Robert L. Canterbury, Deputy Director of Operations, Park and Recreation, City of McAllen shared his firsthand experience, issues, problems, and challenges in managing public information, donations, and volunteers at the City of McAllen to my graduate students in SOCI 6331.01 Disasters on October 10, 2017. Mr. Pilar Rodriguez, Executive Director, Hidalgo County Regional Mobility Authority shared his firsthand experience on utilizing GIS for promoting recovery and mitigation in SOCI 6331.01 Disasters and Society course offered by Disasters Studies M.A. Program at The University of Texas Rio Grande Valley (UTRGV) on October 17, 2017. Julie Gaucin, Service Extension Representative of Salvation Army–Texas Division, Region 1 Coastal Bend & Southeast Texas shared her firsthand experience in disaster response activities in the aftermath of Hurricane Harvey and Hurricane Irma to my graduate students on November 21, 2017. Shawn Snider, Emergency Management Coordinator, the City of Edinburg shares his firsthand experience on all hazards emergency and disaster management in the city on November 28, 2017. Kevin Hannes, Federal Coordinating Officer as well as the Representative of the President of the United States shared his firsthand experience on Presidential Disaster Declaration Process to my graduate students on December 13, 2017. Students are provided with this experiential learning opportunity to learn disaster preparedness of individuals living in the Rio Grande Valley. To do so, the students and I prepared an online survey questionnaire which was approved by the Internal Review Board of the UTRGV. This album shows pictures taken during the volunteering activities in rebuilding after Hurricane Harvey at the Mr. and Mrs. Kress house in Rockport, Texas, on November 15, 2017. This album shows moments they shared with the female emergency coordinator and learned her firsthand experiences on how to become a successful professional in this disaster and emergency field. The moments of excitement during the reenacting of the EOC in the Hurricane Harvey event. A service learning opportunity at a volunteering center. This service learning opportunity provided the students to understand the severity of the Hurricane Harvey and its impact in Rockport area.